In traditional Samburu society a woman’s role is in the homestead looking after the children and goats, collecting water and firewood, cooking meals and generally running the house. Until very recently, few Samburu girls received an education and it was almost unheard of for a woman to go out to work. Today, new generations, new opportunities and new ideas, mean that the old ways are starting to change and the Sera conservancy is helping to push these cultural changes along by employing local Samburu women to work alongside men. 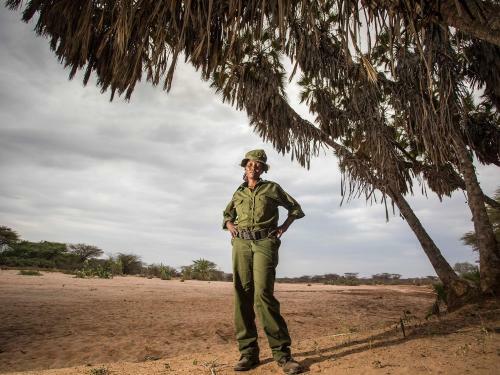 Jalisa Lengope is one of this new generation of independent, working Samburu women. “I’ve been working for Sera for three years. Before that I just helped my mother at home. I entered school very late because my parents didn’t understand the need for education because my family were pastoralists and we migrated everywhere. It was my uncle who got me into school. I spent eight years at primary school before moving onto secondary school where I got good marks. In (traditional) Samburu culture it’s not normal for a woman to be educated. My parents didn’t know why I wanted to go to school at first but now they are proud of me. I work as a radio operator for Sera Conservancy. There are six of us; four women and two men, and we deal with all the communications between people working for the conservancy. Every morning the rangers go out very early and track the rhinos. Once they’ve located them they radio us with the GPS location of each rhino and we inform the (Northern Rangelands Trust) headquarters in Lewa. Although most of the people who work for Sera are still men they do listen to us women when we tell them what to do. I like my job because I’m now comfortable and able to buy my own clothes, pay for my children’s school fees and help pay the school fees for my brothers and sisters children. It’s like a family working here. We share our meals and if I have a problem I talk about it with the other women and men and we try and help each other. The hardest part of the job though is looking after my children while I am at work. I would definitely encourage other women to do this same job. If not where are you supposed to get money for food, shelter and clothes? There is no job a man can do that a woman cannot do. If a man is a ranger and carries a gun then a woman can also do that”.